Come hear the story of Christmas! 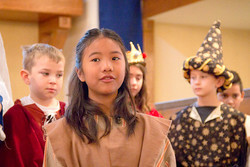 Join the children of St. Paul’s as they present The Story of Christmas on December 16 at the 9:00 a.m. service. Angels, Shepherds, Wise Men, Animals, Soldiers and the Holy Family will all be ready to share their talents and excitement with you as they tell the story of Jesus’ birth. After the pageant, join us in the parish hall for a festive coffee hour. We still have openings for non-speaking actors and actresses (no prior experience necessary), so please contact Christine Ingram if your child would like to participate in the pageant.